Why support East Tennessee PBS? As the nonprofit, viewer-supported PBS affiliate for all of East Tennessee, we depend on individual donations from viewers like you to make our award-winning arts, news and educational programs available to viewers. Supporters like you represent the single largest source of funding for East Tennessee PBS. We're proud to provide you with quality local programs like A Fork in the Road with Chef Garrett, Scholars’ Bowl, Tennessee Life, Up Close with Stephanie Aldrich, and Marshal Andy's Riders of the Silver Screen; national PBS programs like Antiques Roadshow, NOVA, Nature, NewsHour, Frontline, Masterpiece’s Downton Abbey and Call the Midwife; and family programs like Sesame Street and Curious George. We pay more than $650,000 a year for the national programs alone — a figure that doesn't include our local programs or productions. Please join our family by donating today. Television wouldn’t be the same without East Tennessee PBS, and East Tennessee PBS wouldn't be the same without you. All donations make a significant impact. Our basic $30 membership level gets you our monthly print program guide mailed to your house and subscribes you to our weekly eblast. Members of the Legacy Society have made provisions for East Tennessee PBS in their estate planning. For more information, contact Gary Ellis at (865) 595-0239 or email gellis@easttennesseepbs.org. Satisfaction You are helping provide the finest programming available for your friends and neighbors. Our award-winning programs give you front row seats to the best performances around the globe; keep you informed of the latest national, international and financial news; and promote lifelong learning with the best nature, documentary, travel and how-to shows on television today. Our children's programs deliver dependable and trustworthy lessons for early childhood development. Members make this programming available to all viewers. 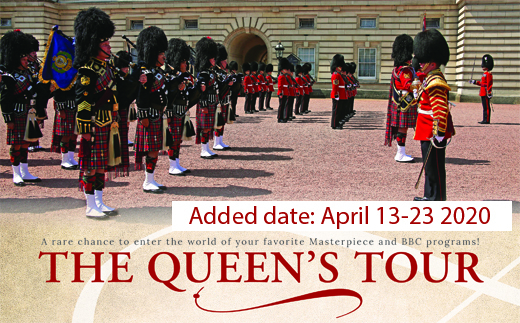 Quality East Tennessee PBS is dedicated to presenting the highest quality local and national programming in a wide variety of genres — arts, education, history, nature, news, public affairs, science and children's programming. We are your station, airing award-winning national shows and local programs that celebrate our community, preserve our heritage, and educate and entertain our viewers. Value In a 2014 survey, PBS and its member stations were again named No. 1 in trust among nationally known institutions and called an “excellent” use of tax dollars by the American public in a national poll for the 11th year in a row. This 2014 survey found that the American public considers PBS KIDS the most educational TV/media brand, the safest place for children to watch television, the safest online media destination, as well as the top provider of content that helps children learn reading, math and essential skills. PBS KIDS significantly outscored cable and commercial broadcast television in each one of these categories. Download a copy of the survey and its findings here. 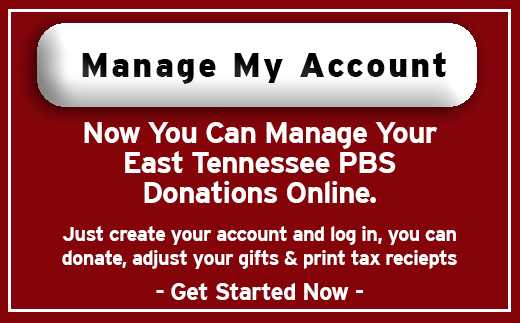 Flexibility You can support East Tennessee PBS in a variety of ways. Feel free to call us any time with a pledge of support, make a donation by mailing a check to the address below or click here to contribute online via our secure website. We accept membership support by cash, check and all major credit cards. We also accept donations through appreciated property, stock, life insurance policies and charitable bequests in wills or trusts. Gifts can be designated for special interests or left unrestricted. A member of our staff would be happy to sit down with you and your financial adviser to discuss your options. For more information about member benefits, please contact Membership Manager Gary Ellis at (865) 595-0220 ext. 239 or via email.